The importance of daily tooth brushing seems obvious. Unfortunately, daily brushing isn't very effective if you aren't doing it correctly. At Thomas Family Dentistry, we want all of our patients to be educated about the benefits of proper oral hygiene to ensure a lifetime of healthy, beautiful teeth. The following brushing basics from the American Dental Association can help you keep your teeth in great health. Brush at least twice a day, especially after meals and before bed. Soft-bristled brushes are recommended for thorough, gentle cleansing of the teeth and soft tissues of the mouth. Brush lightly. Brushing too hard can damage your gums. Brush with a fluoride toothpaste- it's best for fighting plaque and cavities. Brush for at least 2 minutes, ensuring you reach all surfaces of each of your teeth. Use short, back-and-forth motions to clean the inside and outside surfaces of the teeth, as well as the chewing surfaces and areas around fillings, crowns or other restoration. Brush at an angle gently along the gumline to prevent gum disease. Remember to brush your tongue to remove bacteria and reduce bad breath. Follow brushing with a fluoride mouth rinse for added protection and fresh breath. Floss daily to remove debris from hard to reach areas and along the gumline. 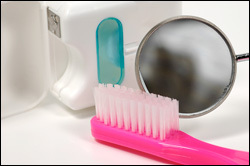 Replace your toothbrush as soon as it becomes worn or at least every 3-4 months. Proper brushing and flossing combined with a well-balanced diet play an important role in the prevention of tooth decay and gum disease. You should also visit our Strasburg office regularly for professional cleanings and oral exams. We can help you determine what types of oral care products and techniques will be most effective for you and your family.